Scheme 14 16-Mer sialodendrimer synthesized using divergent anchoring of isothiocyanotophenyl sialoside onto PAMAM backbone. Scheme 15 Dendritic 9-mer sialoside (3n growth) built on gallic acid core using hydrophilic oligoethyleneglycol spacer. been recognized with cell adhesion molecules (selectins), where it was established that mediocre in vitro results with sialyllactose do not necessarily translate to poor in vivo experiments . 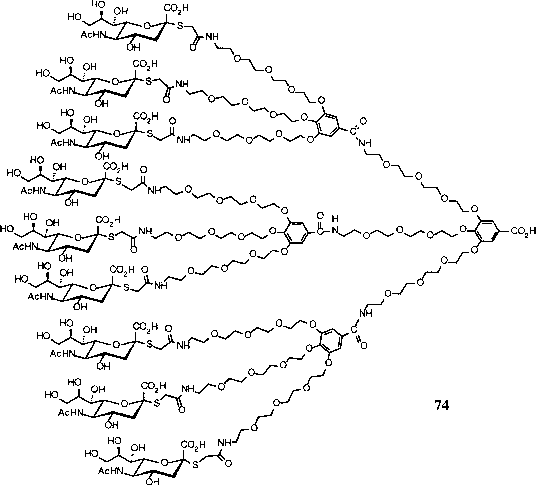 As seen from the synthesis of glycodendrimers derived from the oligosaccharide portion of ganglioside GM1 (Gal^(1-3)GalNAc^(1-4)[Neu5Aca(2-3)]Galj8(1-4)Glc|8) built on PAMAM and poly(propyleneimine) dendrimers , the inhibitory properties against cholera toxin B subunit and E. coli heat-labile enterotoxin showed IC50s values 15-fold lower than that of GM1 itself and 1000-fold lower than that of the oligosaccharide. fucose and the appropriate glycosyltransferases . Notably, all eight branches of the preformed glycodendrimer could be fully glycosylated to provide octameric sialyl LewisX tetrasaccharides in excellent yields.